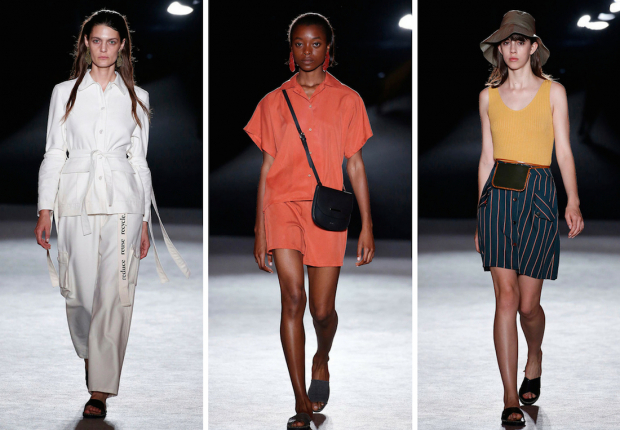 “Saudade” is the name of the new collection by amt for spring-summer 2019. Las Açores, Portugal, with their vegetation and changing climate, are the starting point of a minimal, casual and organic womenswear collection where the natural fabrics, like cotton, are the main element. Young designer Adrià Machado, from the fashion school LCI Barcelona, dresses the woman in fluid designs among which the highlights are the monocolor dresses and the striped looks, a trend for this summer 2018 that seems to continue next year. The color palette is natural, with écru, white, khaki and touches of orange, yellow and metallic hues for a comfortable and casual summer.